Five players from the University of Notre Dame are moving quickly from their less-than-happy ending to a brand new beginning as the 2019 class of collegians and eligible international players prepares for WNBA Draft 2019 presented by State Farm on Wednesday in New York City (7 PM ET, ESPN2 / 8 PM ET, ESPNU). The confetti has barely been swept up at the Amalie Arena in Tampa after what was literally the most competitive NCAA Women’s Final Four in history. The combined margin of victory in the three games contested in Tampa was 11 points, the lowest total ever. And for the Irish quintet, the margin between ecstasy and agony was merely a sliver. Notre Dame, looking to defend its 2018 championship, fell 82-81 to Baylor on Sunday night in the NCAA title game in a game that was decided in the final seconds. The title game marked the end of the stellar careers of all five Irish starters – Arike Ogunbowale, Brianna Turner, Jessica Shepard, Marina Mabrey and junior Jackie Young, who declared Monday that she would be entering the draft and forgoing her final year of college eligibility. Each of them brings something different to one of the most diverse, deep and talented draft classes to come along in a recent years. 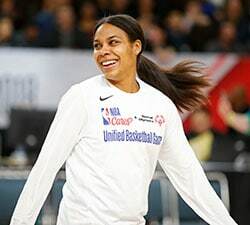 Even that top pick, however, is the subject for speculation as star center Liz Cambage remains unsigned for the 2019 season that begins in just a few weeks and there is a distinct possibility that high draft picks – including potentially the No. 1 pick – could be part of any deal for a team that wants to secure Cambage. That includes Aces coach Bill Laimbeer, who has made no secret of the fact that he may be looking to deal that coveted No. 1 pick to make his team, which barely finished out of the playoffs last season, even better. In addition to the five Notre Dame players entering this draft field, collegiate stars such as Asia Durr from Louisville and national player of the year Megan Gustafson of Iowa are ready to begin their professional careers as impact players. Durr is projected as a top-three pick for a team that’s looking for a player that can create her own shot and play well on both ends of the floor. Gustafson joins a group of post players, headlined by Baylor’s Kalani Brown and Mississippi State’s Teaira McCowan, who tower at 6-foot-7 each. 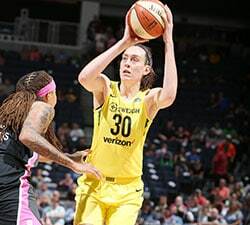 All will intrigue teams looking to bolster their post games and compete against the likes of WNBA centers such as Sylvia Fowles, Brittney Griner and Tina Charles. Connecticut stars Katie Lou Samuelson and Napheesa Collier, still likely smarting for the Huskies’ elimination by Notre Dame in the national semifinals, enter the draft as highly regarded pro prospects because of their length and all-around skill sets. The first-round will also likely include players like Stanford’s versatile forward Alanna Smith, or Cal’s Kristine Anigwe, who averaged an eye-popping 22.3 points and 16.2 rebounds a game, collecting a double-double in 32 consecutive games. For the WNBA teams looking to retool, this draft presents a multitude of opportunities and a little something for everyone, whether it’s a post or a dynamic guard or a do-everything wing. 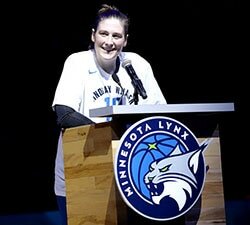 With the Minnesota Lynx moving forward in 2019 without Lindsay Whalen (retired) and perpetual MVP candidate Maya Moore, who is taking a year off from the league, the Lynx will be in a rebuilding mode for the first time in a long time. 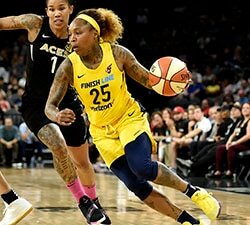 A team like the New York Liberty, with a new owner, will be looking for a new start after finishing outside of the playoffs last year for the first time in four years, and looking for someone with their No. 2 pick to complement the considerable skills of Charles. Ogunbowale, who was a national star after hitting a pair of buzzer-beaters in the 2018 Final Four, is projected to be a high pick because of her offensive skills and her penchant for clutch play. Turner is a long, athletic post, while Shepard’s stock has risen with her gritty play in the paint. Mabrey is a strong 3-point shooter and an energy player, while Young, who made her decision less than 24 hours after the national championship game, is a big-bodied guard who will present teams with matchup problems. Los Angeles Sparks head coach Derek Fisher will be making his first draft picks as a WNBA head coach. And he will be starting off with a strong draft class.